I remember being at a diner once when a well-intentioned waitress introduced a Pakistani man, who was sitting alone, to an Indian man, who was with his son. She must have thought that since they both were originally from the same general region surrounding Kashmir, they would likely become fast friends. At first, this seemed similar to a New Yorker in Shanghai being introduced to someone from New Jersey. In that case, had I been the New Yorker, I would have chuckled at the absurdity of it all and extended my hand to the New Jereseyite with a wink—but that’s not what happened in the diner. You see, Pakistanis and Indians in the contested region surrounding Kashmir have been at odds for generations, and the mistrust of each side has been passed down from father to son and even followed them to New York. The waitress knew instinctively from their body language she’d made a mistake. Parents teach us so much when we are children. But as we mature, we sometimes need to recognize when we are being exposed to a position or bias that is not something to emulate. This is easier said than done, however; and in our effort to fit in and gain approval, we often adopt our parents’ beliefs. I reflected on this as I finished the second half of my book, Failed Moments, which chronicles the deep-seated tensions that erupted between the Irish and Blacks in New York City during the Draft Riots in 1863. In the 150 years that followed this terrible riot, the Irish became one of the most dominant ethnic groups within the NYPD. Did each of the generations that passed since 1863 accept these terrible lessons from their fathers? And if so, did they, in turn, pass them along to their children? Could this long-entrenched bias be at play at some very deep level in the year 2015 and somehow be part of this perceived police/Black problem? The answer is probably not—sorry for being so sensational, but it is an interesting theory. Let me tell you why. As someone who always knew he was 50% Irish and recently discovered he is 25% Black, I am in a unique position to reflect on this question. I lived my life in more of an Irish world as a kid. I never heard racist comments from my Irish father, but I do know that the chain of racism was broken with his generation. My grandfather on the Allen side, whose family came to the United States after the Great Irish Famine in the mid-1800s, died in 1958 with some terrible positions on issues of race and religion. My father, who loved and respected his dad, knew that those lessons were not to be learned and certainly not to be passed down to the next generation. If my Irish family took about one hundred years after the Draft Riots to shake their views, is it inconceivable to think that others still hold them? Perhaps not. I can reflect on how, as a young man, I never espoused any racist views, but I might have let a racist comment from someone else go, in order to fit in. As I became an adult, however, I never let anything go—and of that, I am proud. With the success of Allen’s Alley under their belts, the Allen brothers looked north to the Bronx and scouted out new locations for another nightspot. They found an Irish bar where a doorman strictly enforced a “No Black” rule, which was just fine with the clientele. My father and brother liked the bar’s location and purchased it, but the rules quickly changed. 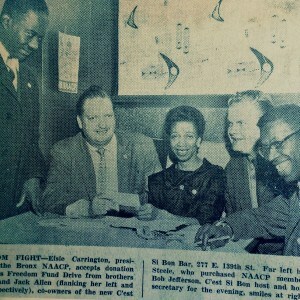 Given that my father was “the brains” and my uncle, “the brawn,” in their lifelong partnership, I’ll assume my father came up with the idea of holding an NAACP rally on St. Patrick’s Day and my uncle provided the security. Talk about a bold move. 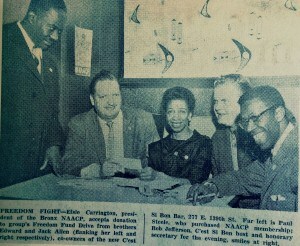 There is a clip from The Amsterdam News on April 6, 1957, which pictures my father and uncle presenting their donation to the NAACP. 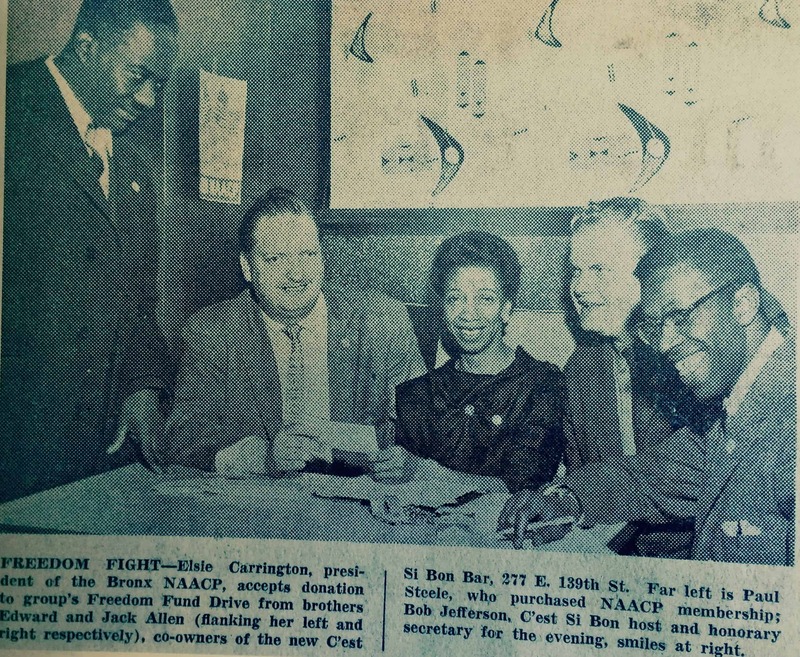 While I found the Irish/Black conflict dating back to the mid-1800s fascinating when writing my book, the connection may not be so valid today. The NYPD was half Irish in the mid-1800s, 5/6 Irish by the turn of the century, but the Irish are no longer the most dominant group on the force. The increasing numbers of Hispanic, Black, and Asian officers (over half the NYPD) provide a logical argument against any generational prejudice being at the heart of our modern-day incidents. When an incident like this takes place, there seems to be an urgent and immediate need to show unity and support for one of our own. This is true within the police department as well as within the Black community. The responses outside of these two groups also tend to be automatic based on long-held beliefs. In my opinion, these strong automatic responses often get in the way of the truth and ultimately do not serve either side.